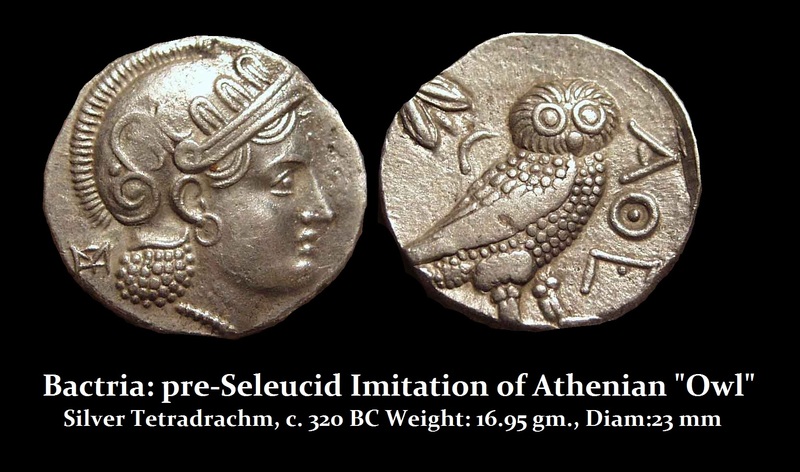 The hoard of Athenian Owl tetradrachms has revealed something incredibly important. The seminal work of Chester Starr (Athenian Coinage) identified five groups of designs covering the period 480-407BC. While Starr examined known coins in museums and collections, he did show photographs and attributed them to a declining quality of execution based upon the fact that in 449BC, Athens moved the treasury reserves to Athens and then issued the Athenian Coinage Decree circa 449BC whereby all member states of the Athenian Empire known as the Delian League, founded in 478 BC, was to use only Athenian coinage. The Delian League varied but the association of Greek city-states members numbered between 150 to 330. The entire silver reserves were moved to Athens, 5,000 talents in total, from which Athens struck at least 7,500,000 silver tetradrachms. Some scholars have argued that Athens did not issue coins with a worldview. That is really just speculation and opinion. What is very clear is that the outlying regions around Greece began to imitate the Greek coinage. Scholars also simply stated without verification that coins traded by weight. That is not supported by the fact we find imitations of Athenian Owls from everywhere including Celtic versions in Europe to Egyptian in North Africa to much of Asia in Bactria (modern Afghanistan). There are even imitations known from Judaea. 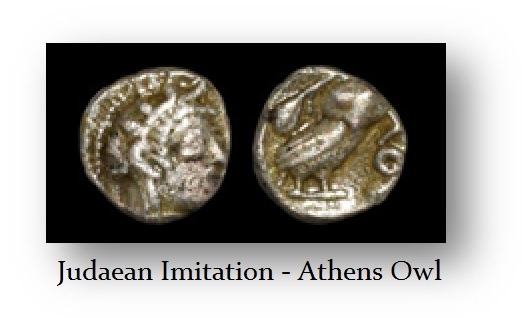 These are not counterfeits, but taking silver and striking it in the form of an Athenian Owl. This demonstrates a CRITICAL point. The academics are terribly wrong in assuming that Athens took no view of the world or that coins traded by simply weight. 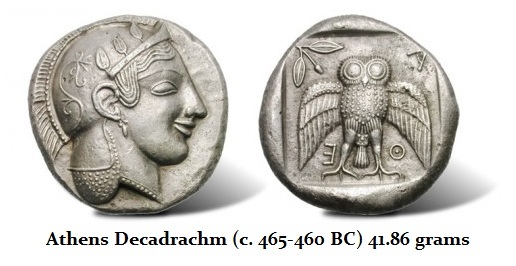 The Athenian Owl was widely accepted pre-Alexander the Great as the first world currency BECAUSE of its power just as the US dollar is accepted worldwide for the very same reason. Athens also produced the Athenian Decadrachm which was like $1,000 bills. These coins too valuable for everyday commerce. Instead, they were clearly used in trade for they are found around the Mediterranean ports, but rarely in Athens itself. This reflects that this coin was used for large transactions in trade. Besides the owl pictured with spread wings and facing, note the hair is beaded with one strand before the helmet and what is protruding below the helmet. Here we have a Syrian imitation of didrachm or half a tetradrachm weighing just 6.8 grams. However, note that the reverse is copying the design of the Decadrachm confirming these were used in trade. 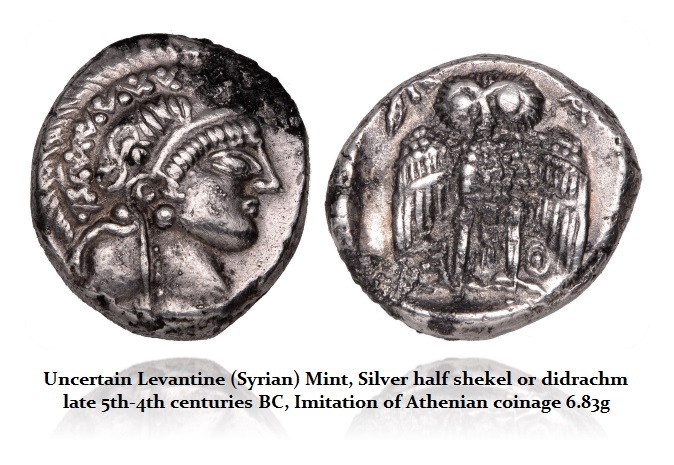 Once again, we do not have a counterfeit, but striking silver in the image of Athenian coins which were an accepted image of power and wealth in the ancient world. Obviously, if silver traded by simply weight, then there would be no reason whatsoever to strike imitations of Athenian coinage. 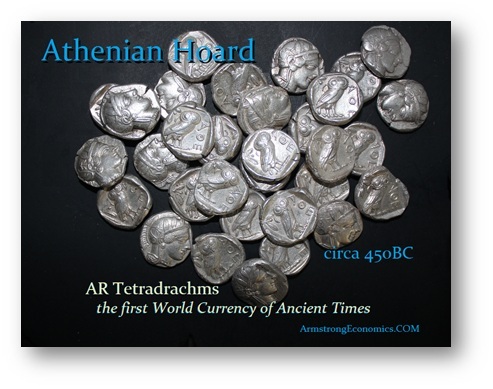 Because this was a sizable hoard with many different dies, there appears to be the early period of converting these 5,000 talents of silver into tetradrachm coinage where the design showed the beaded hair. Because of the great pressures to produce some 7.5 million coins, the die cutters began to cut corners. We then see the beaded hair before the helmet turns into just a straight line. These are reflecting the enormous pressure to produce coinage at this point in history. It was this massive production of coinage that made Athens the financial capital of the ancient world. Coins can be purchased at the link below and are limited to US buyers only due to shipping regulations.